Prominent & Leading Manufacturer from Ahmedabad, we offer haul off unit. We are one of the trusted names in the market to offer a highly durable range of Haul Off Unit. 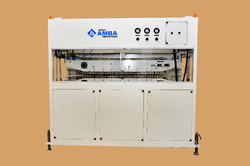 The offered machines are specially designed rubber pulling belts-twin and multi-track system. These are driven by one AC motor coupled along with reduction gearbox. Further, there is an optional belt available for up-down movement and grip pressure by the hydraulic cylinder for slip-less pulling.